SYNOPSIS: Former getaway driver Charlie Bronson puts his Witness Protection status in jeopardy when he tries to help his girlfriend get to Los Angeles. While on the roadtrip, Bronson and his girlfriend are pursued by both the feds and his former gang. REVIEW: David Palmer, director of the acclaimed Showtime documentary Stripped: Greg Friedler's Naked Las Vegas, reteams with his Brother's Justice writer and star Dax Shepard in a new action comedy entitled Hit and Run. Annie (Kristen Bell, Big Miracle) and Charlie Bronson (Dax Shepard, Idiocracy) live a romantic, semi-idyllic life in a small town. When Annie is given the opportunity to create a college program in Los Angeles by her college dean Debbie (Kristen Chenoweth, Four Christmases) she is forced to make the decision to move away to LA without Charlie. The reason why she would have to leave him behind is because Charlie is in witness protection and unable to travel outside the city limits. After some soul searching, Charlie decides to leave the program and his US Marshall handler Randy (Tom Arnold, Madea's Witness Protection) to drive his girlfriend to LA for this once in a lifetime opportunity. But driving Annie to the City of Angels carries with it more than just the miles on the odometer. Charlie's old bank robber buddies Alex Demitri (Bradley Cooper, Limitless), Allen (Ryan Hansen, Last Call) and Neve (Joy Bryant, Welcome Home, Roscoe Jenkins) get tipped off and put the pedal to the metal on Charlie's trail, Annie's obsessive ex-boyfriend Gil (Michael Rosenbaum, Smallville) tries to get her back, US Marshall Randy tries to save his career by getting Charlie back into the town limits, and Charlie has to deal with the repercussions of hitting the open road again. Dax Shepard and David Palmer create a throw-back action dramedy with plenty of horsepower. Filled with car chases, open road discoveries, and high-speed pursuits, Hit and Run starts off idling for a while before the accelerator jams into the floorboards. At times the story seems more comedic than dramatic, flip-flopping between the two. Tom Arnold's US Marshall Randy has more goofy and unwarranted things happen to him in and around a vehicle than one man should endure. Michael Rosen's ex-boyfriend Gil brings plenty of angst and obsessiveness to become more than just a funny thorn in Charlie Bronson's side. Bradley Cooper's bank robber mastermind rides a double yellow line between tracking down Charlie and dispensing passionate advice about the proper dog food to buy. Hit and Run starts to accelerate when Charlie and Annie leave their small town behind. Once the town limits fall away in the rear view and Charlie opens up the throttle of a custom rebuild 700 horsepower 1967 converted Lincoln Continental project car heading west, the couple find more than their fair share of obstacles. With Randy, Gil, and all of Charlie's old bank robbery buddies on their trail, Charlie and Annie's relationship is put to the test. Shepard and Palmer make great use of both high-octane high-speed pursuits and great 60s and 70s thumping music. From Jimmy Hendricks to James Brown to AC/DC, every selection of music is perfectly placed in the story. Aside from heart-pounding anthems, Shepard and Palmer also insert some choice lighter selections to counter some strange moments, especially during an interchange between Bradley Cooper's dog lover and a muscle-head who does treat his animals with the same level of respect. Car chases abound throughout - as one would suspect - taking advantage of a variety of vehicles including the Lincoln Continental, a lighter Pontiac convertible, and even a minivan! The story is filled with pithy dialogue, some funny and some more serious. Add in car chases, pursuits, and some heavy-handed pursuers, and you have a wild, indie ride. There have been flicks with superior car chases like Smokey and the Bandit, movies with better banter like Pulp Fiction, and stories with more heart. 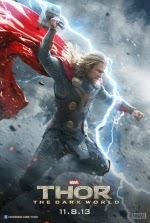 Dax Shepard and David Palmer do put together a solid thrill ride that does have its charms and crashes. Hit and Run has been screening for several months. On the eve of its release, this small indie flick should have enough horsepower to carry it a ways down the asphalt. 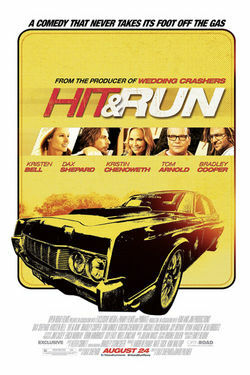 Funny and adrenalized, and filled with action and adventure, Hit and Run runs on most cylinders.